Expelliarmus! 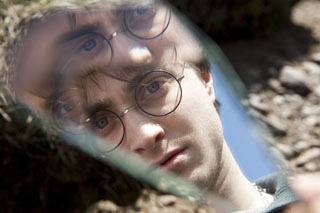 Boy Who Lived, 1, 3D, 0! Variety goes inside the mechanics of Warner Bros.’ decision. But I’m pretty sure it was WAVE-3 that showed Gorilla at Large in 3D one afternoon, and somehow or another my dad got me a pair of 3D glasses for the viewing. Not understanding that it was an optical illusion and not some kind of living hologram, I remember looking over my shoulder to see if the gorilla was sorting through my mom’s Elvis records after swinging out of the TV. Once I figured out what 3D really was, I think I went outside and pretended to be Luke Skywalker for a few hours (which still might happen from time to time; I said “might,” so that’s not an admission). When I watch a movie, I watch a movie. I want to absorb every detail on the actors’ faces, in the costumes, in the scenery, on the sets. I think 3D takes something away from that, even in something like Avatar, in which it was done very, very well. I just want to swept away, and if the film is made well enough, and shot well enough, well, that’s really all I need to be drawn inside the world of the story. After Avatar did big — well, the biggest — business, many of the studios scrambled to cash in on the 3D craze. The problem is that many of these projects weren’t initially designed with 3D in mind or even filmed with 3D cameras at all, but rather were subjected to a conversion process that often made the 3D imagery look more like the cardboard cutouts that waddle around on South Park. Two of this year’s worst offenders — Clash of the Titans and The Last Airbender — came from Warner Bros., and the press hasn’t let them forget it. Now, however, Warner Bros. has made the right call by calling off the 3D release of Harry Potter and the Deathly Hallows: Part 1, which opens November 19. According to Variety, Warner Bros.’ brass pulled the plug when they realized they “couldn’t complete 3D conversion to stereoscopic” in time for the theatrical release. This decision — and it’s a wise one — does not affect the IMAX release of the movie, which will still happen simultaneously with the standard 2D release. It also doesn’t affect Warner Bros.’ plans to release Deathly Hallows: Part 2 in 3D on July 15, as they say they’ve got plenty of time to do a proper conversion for that one. This is a rare and admirable case of the studio realizing what’s best for the movie and acting on that realization, putting the quality of the director’s work ahead of the extra pennies it would receive from gimmickry. It’s interesting to note that Christopher Nolan, their number one moneymaker and the man whose guiding hands are behind the next adventures of both the Dark Knight and the Man of Steel, told Hero Complex in June that he still has lots of issues with 3D, and he explained the format’s limitations in fascinating detail. Meanwhile, Nolan’s cinematographer Wally Pfister shared his own 3D concerns with MTV, along with expressing his hope that the next Batman movie is shot entirely in IMAX. I highly recommend reading both articles. Nolan’s one of the most thoughtful craftsmen working in film today, and I hope the studios will remember to put their faith not in gimmicks and fads but filmmakers like him who believe in taking us on grand adventures the old-fashioned way — through our hearts and minds, and not with flimsy glasses covering our eyes.